Your favorite gothic outfits should have equally great gothic shoes as their finishing touch. We carry a wide selection of mens gothic footwear perfect for your needs. 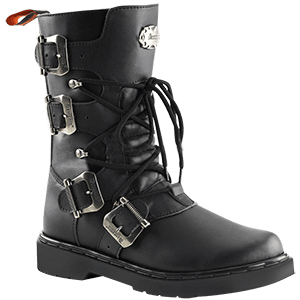 Our gothic combat boots, skull boots, black leather boots, and gothic dress shoes feature bold details like chains, rivets, large buckles, brass knuckles, decorative bullets, and more. Several of our gothic boots feature a platform for a dramatic look, and others fit all the way up to the knee for max coverage. Suitable for casual wear or formal occasions, these mens gothic shoes come in a range of sizes to ensure a great fit. No matter what kind of gothic fashion you prefer, you can find the right pair of shoes to suit your tastes here.